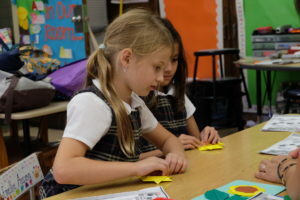 Saint Saviour Catholic Academy offers an After School program open to all grade levels. Our program will begin on Monday, September 10th for grades 1 to 8, Wednesday, September 12th for Kindergarten and Monday, September 17th for Full Day Nursery and Pre-K.
To accommodate the difference in dismissal times, parents/guardians with Nursery or Pre-K children as well as older children enrolled at our Academy will be given a 30-minute grace period (2:30 – 3:00 PM) to pick up their Nursery or Pre-K child. After 3:00 PM, regular After School rates will be incurred. Children must be picked up by 6:00 PM. Please be on time! Parents will be billed $20 per every quarter hour (15 minutes) after 6:00pm. At dismissal time, children are picked up from their classrooms by an After School teacher and taken to the classroom designated for their age group. Snack is served, followed by time for homework, recreation, and creative projects. Weather permitting, children will go to the Parish courtyard, on walks around the neighborhood, or to Prospect Park. If a child is registered for an Enrichment class, they are escorted to their class at the appropriate start time. Please note enrollment for some classes is limited and is based on a first come first served basis. The Enrichment schedule runs on a trimester rotation. Families may choose the coverage (regular After School, Enrichments or combination of the two) that works best for your child care needs and budget. You will be charged for a full half hour if your child stays for part of the next half hour cycle. Monthly account invoices are due upon receipt and will be sent via email after the end of each month, since billing for monthly accounts is based on attendance. Your bill must be paid within two weeks after receiving the monthly invoice to avoid a late payment charge. Please pay promptly. Failure to pay on time will result in a $25 late payment fee. In order to participate in the SSCA After School Program, you must be current with your payments.Accounts that fall behind may result in your child’s dismissal from After School. There is no hard deadline for choosing a prepayment option. Should you require time to figure out your schedule as the school year progresses, changes to your payment status can be made at the discretion of the After School Director. 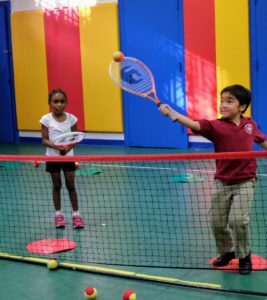 Contact Althea Alvarez, the SSCA After School Director, at aalvarez@sscaparkslope.org or 718-635-1142 with any questions.